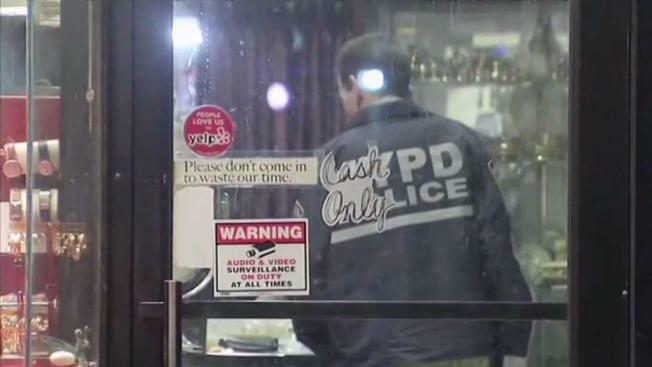 A group of robbers made off with hundreds of thousands of dollars in jewels in a violent heist in Brooklyn on Thursday evening. Now we're getting our first look at the suspects. Marc Santia reports. A 67-year-old jewelry store owner was left beaten and bloodied after a gang of thieves attacked him and robbed his store in downtown Brooklyn on Thursday evening, police and law enforcement sources said. A law enforcement source says at least one of the four robbers dressed up in a construction vest and hard hat, while another is believed to have worn a coverall found discarded in the Borough Hall subway. Three of the robbers entered the jewelry store on Court Street around 5:30 p.m., police said. Witnesses said one of the men had positioned himself outside of the store wearing a white hazmat suit and holding a sign that read "Danger asbestos. Men at work." The robbers pistol-whipped the owner over the head before taking off with what witnesses describe as bags of loot. Surveillance video released by police Friday shows suspects wanted in a violent robbery at a downtown Brooklyn jewelry store on Thursday evening. The men allegedly beat a jeweler before making off with $800,000 worth of loot. 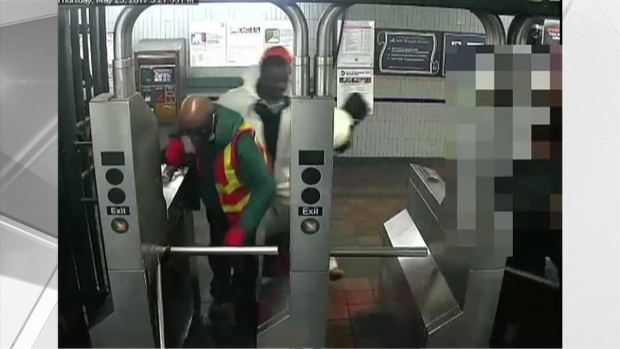 The video shows them hopping turnstiles in the subway after the robbery. Sources say the stolen goods, which included gold and cash, are valued at around $800,000. The bloodied and injured owner chased the suspects, witnesses said, but the thieves ultimately got away. Photos provided by the Brooklyn Daily Eagle show the jeweler being wheeled away on a stretcher. The store owner was taken to Methodist Hospital with injuries to his head. Police said he is expected to be okay. Police later found the hazmat suit nearby after the thieves fled the scene. Back in February another jewelry store right around the corner, on Smith Street, was held up. The owner of that store also put up a fight, tossing candelabras at the robbers. Police have not given any indication that the two robberies are connected.